Paper, in all of its forms, is one of the most useful and versatile products. It is also one of the most widely used item for college students. The bad news is that our use of paper has some pretty intense impacts on the environment. These include water and air pollution, deforestation, and the accumulation of paper waste in landfills. The truth is, while recycling certainly helps, it doesn’t eliminate the problems our use of paper creates. In fact, the recycling process itself has an environmental cost. Keep recycling for sure, but also consider ways in which you can reduce the amount of paper you use. Here are eleven ways you can get started. Whether your interests are in technology, fashion, current events, music or something else, magazines are full of useful information. The problem is that once you’re done with them, your choices are to recycle them, throw them out, or let them collect dust. None of these things are good for the environment. Instead, convert your paper subscriptions to digital. Not only will you help the environment, you’ll save space as well. Even better, digital copies of magazines are searchable. This means you can find the articles you want with ease. 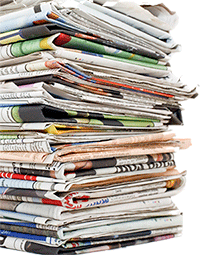 If you do have hard copies of newspapers and magazines at home, don’t throw them out or recycle them. There may be places that are happy to take them off your hands. Your local community center, retirement homes, hospitals and homeless shelters are often in search of reading materials for their clients. There is no way to avoid printing altogether, but you may be able to reduce the paper you use when you do print. Whenever possible use double-sided printing. You can even print more than one page per side. Also, experiment line spacing and font size. With a few adjustments, you can significantly reduce the amount of paper you print over time. Encourage your friends, even your University and College, and your community to do the same. If you are still receiving your bank statements and billing notices via snail mail that’s a problem. Not only are you getting your paper bills and statements, chances are you’re receiving inserts, coupons, and other junk. Convert to paperless mode and eliminate all of this. Shopping lists, reminders, and notes to your roommates represent just a few of the things you likely jot down and have scattered about your place. You aren’t alone. Those bits and pieces of paper add up. You can replace these by simply hanging up a whiteboard or blackboard in a convenient spot. If somebody needs to jot something down, they can use that instead of wasting paper. If you need something a bit more portable, simply snap a picture with your phone. You also don’t need paper to stay on top of your schedule or to coordinate with friends and family members. Instead, choose a digital calendar that works for you. Then arrange to share calendars with those friends and family members. With most online calendars you can create to-do lists, set alarms, and send out reminders. Your local animal shelter or rescue might be thrilled to get your old newspapers. They use these for bedding and as cage liners. Newspapers can also be used to help insulate winter shelters for feral cat colonies. There is no doubt that paper towels and napkins are useful. Many of us use them while we’re eating, to wipe up spills, for cleaning, even for covering food in the microwave. The problem is that once we’re done all of those paper products go directly into the trash. That’s wasteful and bad for the environment. Instead, invest in cloth alternatives. Washcloths and hand towels are exceptionally cheap. Cloth diapers last forever and are amazing for cleaning. Even old worn-out clothing can be cut up and used as dust rags. At this point, there should be little or no occasions where you need to take notes on paper. There are simply too many options for taking notes digitally, not to take advantage of this. Save paper by using an app, such as Evernote, to take and organize your notes. Use voice to text, or simply type up your notes in your favorite word processor. Not only will your digital notes save paper, you’ll be better able to create quality essays and research papers. If you need help to turn these notes into better papers, check out essay editing reviews. Save the planet, and improve your grades. In some cases, you don’t need to take notes at all. See if your instructors save handouts and lecture notes online. Then, simply use these as reference materials. Hopefully, you have ditched single-use plastic and paper bags for reusable ones. If not, this is a great place to start. However, that’s just the beginning. There are other ways to reduce paper use while you shop. First, hit the bulk bins for your dried goods. Instead of using the plastic or paper bags provided, bring your own reusable containers. Next, pay attention to packaging as you shop. You’ll be amazed at the amount of paper and plastic that is wasted through extra packaging. Be a conscientious shopper, and buy products that use the least amount of paper material. While you shop, pay attention to which brands are responsible in their use of paper and which brands are not. Then, let your thoughts be known. If a brand is behaving responsibly in this area, contact them and let you know you appreciate it and will be buying their products. If not, contact them with your concerns. Believe it or not, companies do care what you think, and if they hear from enough people they might change their behaviors. Paper waste is a huge problem at colleges and universities. In fact, the issue can seem overwhelming. However, if every individual would change a few of their habits with regard to paper consumption, there would be a great impact. You can get started with these steps.